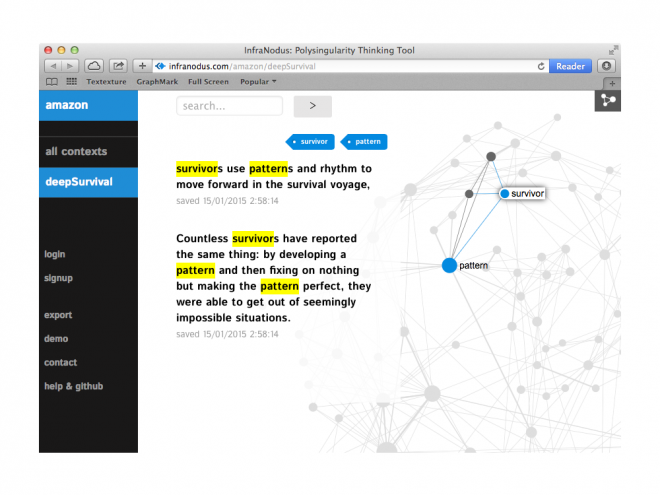 InfraNodus is a cognitive stimulation tool and a non-linear reading machine. 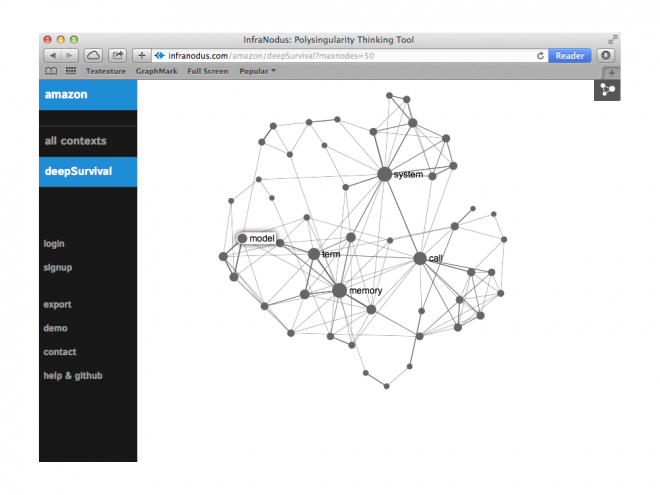 It visualizes any text as a network to show you the most relevant topics, terms and their relations to one another. Just looking at the graph image you can quickly see what the text is about and get a different perspective on text. If you click on any words in the graph, you will quickly get to the excerpt of the text where those terms co-occur next to each other. You can use InfraNodus to compare texts (see the video below), perform text mining operations (including in-built LDA analysis), make sense of bits and pieces of disjointed textual data, create mindmap-like graphs using #hashtags, @mentions or normal language (English, French, German, Russian is supported, Chinese and Spanish are on the way). Using InfraNodus you can glue together any disjointed bits and pieces of information and see how they all connect. It will automatically convert text into network and show you which keywords or concepts tend to co-occur in your research notes, writing, newsfeeds, Tweets or any discourse. This way you will have a better idea of the topics that are present within and of the most influential concepts and keywords. You can also analyze the discourse structure and identify the level of bias — something that no other tool can do. Visualizing text in this way also helps remember it better and makes you connect ideas. When I open my Twitter stream or read news, it takes me about 15 minutes to scroll through all the stuff. This way I could spend 25% of my life reading Twitter and it’s not something I want to do. InfraNodus can help you cope with informational overload. All you need to do is to open the Twitter feed in it and it will show you the most prominent topics in context. This way you can quickly see the picture of the day and find the Tweets that may be interesting to you. Want to learn more? Check out these examples: Visualizing Twitter Newsfeed and News Analysis Using Text Visualization. InfraNodus helps you see the big picture and find the needle in data haystack easily. It also can work as an oracle and point you to the novel ideas and new discoveries through its Insight feature. 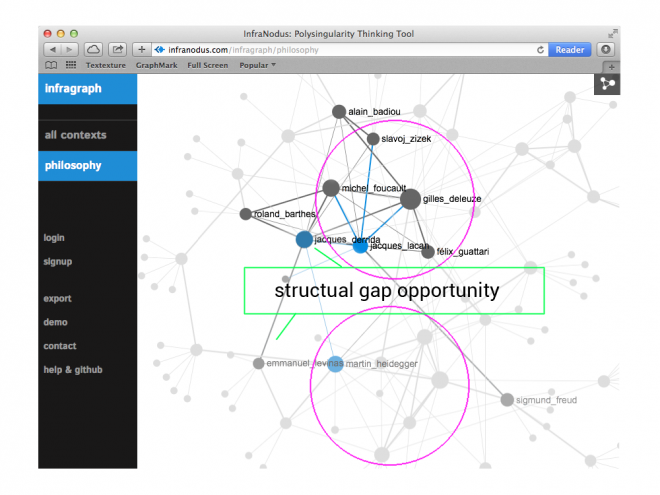 When you represent your ideas as a graph, you will see gaps between clusters of nodes. These are called “structural gaps” and those are the areas where there is a great potential to discover something new. Several studies show that innovation and so-called “creative leaps” occur in these areas. You can also look beyond the periphery of the graph to see where to expand your knowledge. InfraNodus is available as free open-source software, as online cloud-based SaaS, and as a hosted custom enterprise solution. If would like to get access to this tool immediately, you can do so on www.infranodus.com for only €5. As a subscriber you will get priority support, access to the full functionality, and will be able to suggest features and improvements ahead of the development queue. Developing and maintaining InfraNodus takes time and resources and as I don’t want to sell out to investors or get help from institutional funds your contribution is the only way I have to support, maintain, and improve it. If you would like to use the free open-source version and to contribute towards developing it further, you can download InfraNodus on your own computer from our GitHub account. You will need to install Node.Js, Neo4J and have some coding experience to set it up and running. Let me know if you need help with it. Finally, if you’re interested in the enterprise version or if you have other suggestions for a collaborative exchange, please, fill out the form below and I will get back to you. How would you be able to contribute to the project? Help develop a case study? Coding? Develop an enterprise solution? How did you find out about InfraNodus?